Kraus stainless steel kitchen sinks are known for their excellent quality and sturdy construction. This sink is manufactured from premium T-304 surgical grade stainless steel with 18/10 Chromium Nickel content. Kraus sinks are made with heavy-duty 16-gauge stainless steel, the thickest steel available. Kraus sinks are heavier and more durable than competitor products; the extra thick material guards against damage from daily wear, even under heavy use. Extra-deep & spacious basins contain splashing and easily accommodate any large kitchenware, such as baking sheets and stockpots. The rear-set drain opening provides more usable surface area in the basin, and more storage space in the cabinet below the sink. Gently curved tight-radius corners offer a stylish contemporary look, and are easy to keep clean. Kraus is an industry leader in outstandingly quiet kitchen sinks. Kraus proprietary NoiseDefend sound dampening technology is best in class: Extra-thick pads cover over 80% of the sink, virtually eliminating noise from clattering dishes and food waste disposal. Non-toxic protective undercoating not only reduces noise, but also prevents condensation that can damage the sink base cabinet. Kraus commercial-grade satin finish is scratch and stain-resistant, and guaranteed to keep its sheen. To help you keep the sink looking like new, a set of FREE kitchen accessories is included with every purchase. A customer favorite, the solid stainless steel bottom grid has soft bumpers that protect the sink surface. A 100% cotton Kraus dish towel is also included, to help keep the sink clean. To guarantee your complete satisfaction, Kraus offers a Lifetime Warranty on all kitchen sinks. Product experts are available to ensure that all of your questions are answered promptly. FREE KITCHEN ACCESSORIES: Bottom Grid, 3-Piece Basket Strainer, Kraus 100% Cotton Dish Towel, all packaged with sink in a premium Kraus Utility Bag. 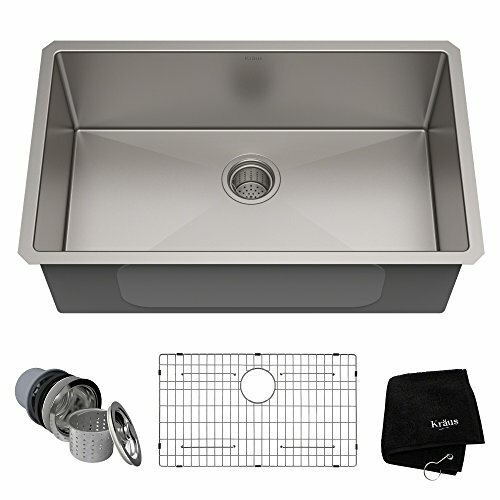 EVERYTHING YOU NEED IS INCLUDED WITH PURCHASE: Sink comes with Installation Template, Installation Instructions, Use & Care Guide, and Mounting Hardware.